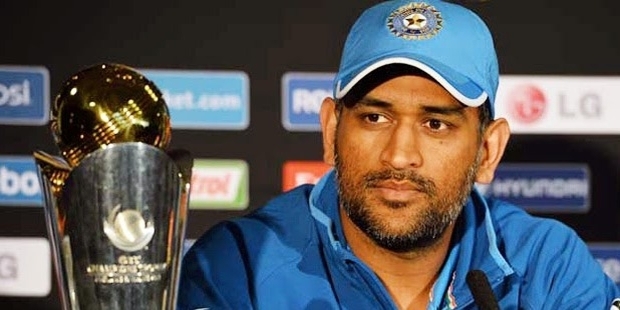 Mahendra Singh Dhoni was born on July 7, 1981 at Ranchi, Jharkhand located in the east corner of India. He studied at DAV Jawahar Vidya Mandir where he was keenly interested in football and badminton. 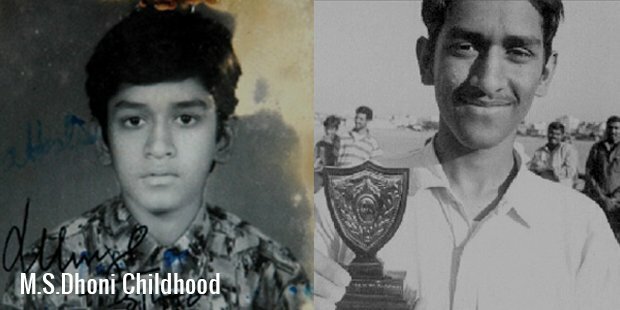 MS Dhoni comes from a typical family. His father Pan Singh, worked for MECON and his mother Devki Devi is a housewife. He has an elder brother, Narendra Singh Dhoni, who is a politician, and a sister, Jayanti Gupta, who is a teacher. He was the goalkeeper of his football team and was able to play for the district and state level. But on the insistence of his football coach, he tried out to play cricket. 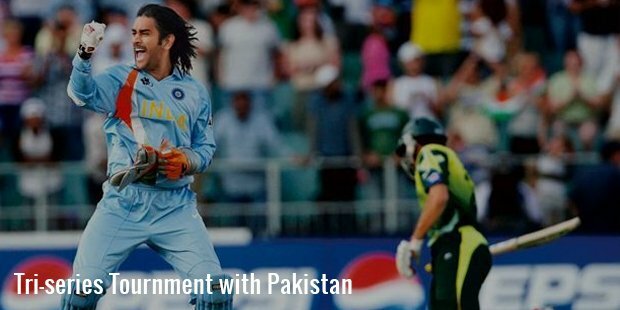 He was able to perform wicket keeping especially well which allowed him entry into a local cricket club called the Commando cricket club where he played from 1995-1998. In the 1997/98 season, his superb performances in the Vinoo Mankad Under-16 Championship attracted the selector’s eye. He was selected to the Bihar U-19 squad the very next season. His improved batting and keeping performances led him to be selected to the Bihar Ranji Trophy squad for the 1999/00 season. He made his debut against the Assam team by scoring an unbeaten score of 68. He scored his first century the next season but was only able to score at a average of around 40 per game by the 2003 season. In 2003, he was selected to the India A team which went to tour Kenya to play a tri-series tournament with Pakistan A as the third team. In the series he scored 362 runs at an average of 72.40 with back to back centuries against Pakistan. On the back of his sterling performances in domestic competitions and international tours, he was given a place in the ODI squad for the tour to Bangladesh in 2004/05. On his debut he was run out for a duck but in his 5th ODI match against Pakistan, he scored 148 off 123 balls to be called a match winning player in the Indian squad. With this performance he had now recorded the highest score by an Indian wicket keeper as well as cemented his place in the side. In November 2005, while chasing a stiff target of 299, he scored 183 off 145balls to take India to victory. He won the ‘Man of that Series’ award for top scoring in the tournament with 346 runs. In the 2007 World Cup he could only score 29 runs in the 3 matches with two ducks which contributed to the knockout in the group stages. Again Dhoni bounced back with impressive performances which led him to be made the captain of the Indian T20 squad in September 2007. He immediately made impact as he led the team to win the inaugural World Cup T20 in South Africa. He was made the captain of the ODI team in 2007 and the Test team in 2008. In 2009, he scored 1198 runs in 24 innings at an average of 70.43 to be the highest scorer of the year in ODI’s. He has been part of the ICC World ODI XI for 6 years in a row from 2008-2013. 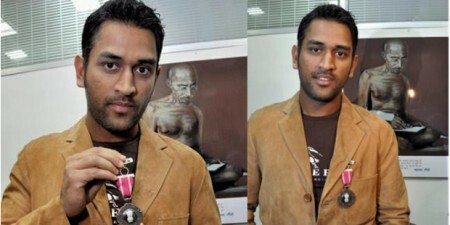 He has been awarded the Rajiv Gandhi Khel Ratna which is the highest sports honor given by the government of India in the year 2008. He advertises more than 15 products as of 2013 and is one of the most marketable players in the world. In June 2013, he was reported to be the 16th highest paid sportsman in the world with yearly earnings of $31 million. He is one of the most successful Indian sportsmen that the world has ever seen. 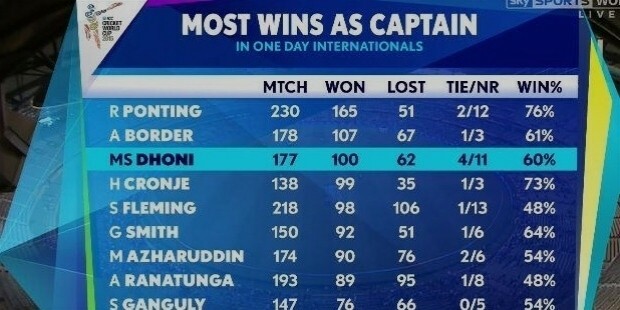 Dhoni is the successful captain that India ever had. He led India to 27 Test match victories in 60 Tests and 107 ODI wins in 194 ODIs as a captain. He captained 70 T20 matches and he had 40 wins in his account. On 4th January, 2017, Dhoni stepped down as captain of India's limited-overs teams ahead of the ODIs and T20Is against England. However, he is still available as a wicketkeeper-batsman. He took the decision in order to give the younger players a chance to lead the side to the next level. 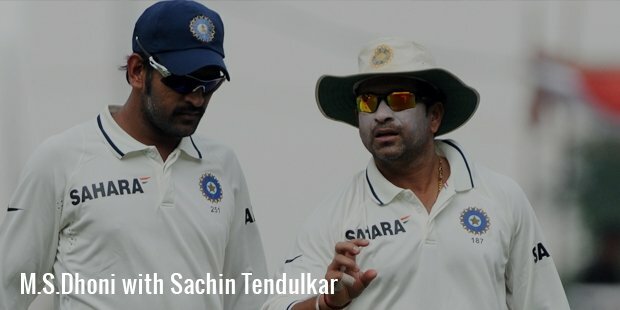 He will definitely be remembered as one of the most successful Indian captains in the history of the sport. 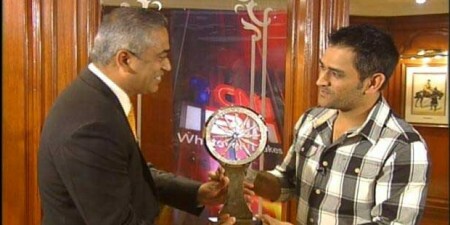 He was made the captain of the Indian Cricket team for ICC T20 World Cup in 2007. He came back from South Africa with the trophy. He was then made the permanent Captain of the Indian Cricket team for ODIs too. The very next year, he became the captain of the Test team too when he, as the then vice-captain had to take the reins against a test against Australia because Anil Kumble, who was the skipper then, was injured. 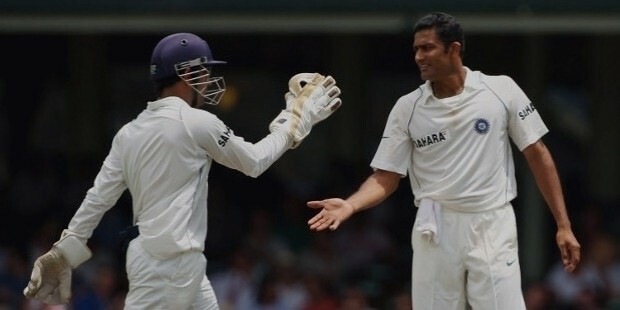 Kumble declared his retirement after that series and Dhoni became the full-time test captain for India as well. 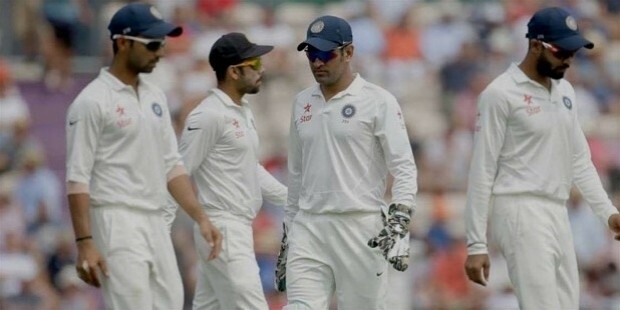 It was with Him at the helm that Team India reached No 1 in the ICC Test Ratings. The score of 726/9 (declared) against Sri Lanka in 2009 was the Highest Test total ever. He won the 2011 ICC Cricket World Cup, becoming the second Indian Captain to do so after Kapil Dev. 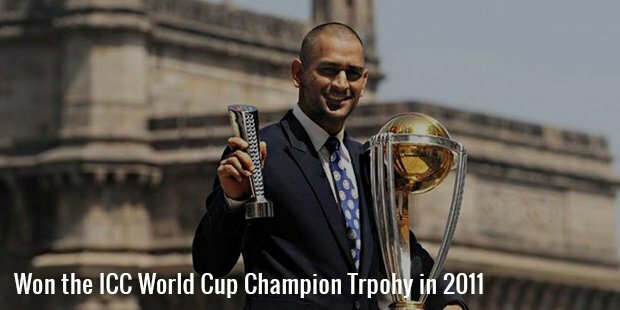 He is also the only captain to have taken home both the ICC world cups ( T20 and ODI). On 17th January 2008, Dhoni became the first Indian wicketkeeper with five international dismissals in an innings against Australia, thus equalling Adam Gilchrist’s record. In the same innings he hit 10 Sixes, the most number hit by any indian in a single innings, and made 120 out of that 183 from Boundaries alone ( 15 Boundaries, and 10 over-boundaries). He made it to No 1 in ICC ODI batting Ranking, the second batsman to do so. In the 2014-15 season, he declared his retirement from test cricket. 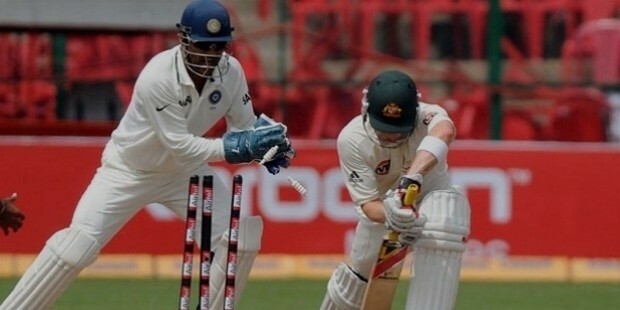 His stumping in his last test match helped him break Kumar Sangakkara’s record of all time stumpings (134). and he also broke the record for the maximum number of dismissals by any Indian Wicket keeper. 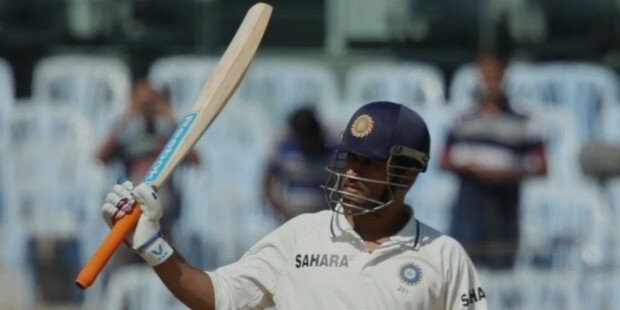 Dhoni’s 224 is the highest score in a Test by a Indian captain, surpassing Sachin Tendulkar’s 217. 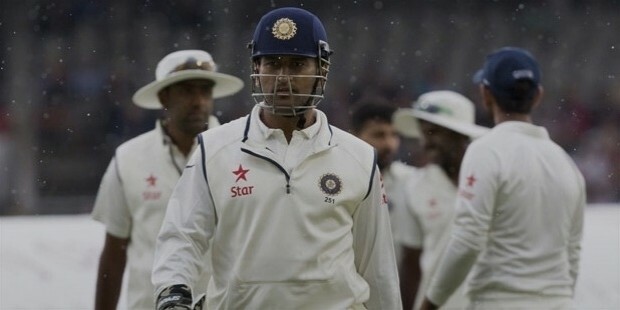 Dhoni is also the most successful Indian Test Captain, having won 24 tests. He is only one of three people in the world to have captained their teams for more than 300 ODIs. He currently ranks third after Ricky Ponting and Stephen Fleming. 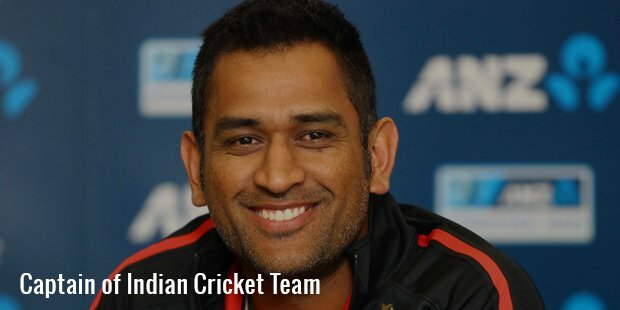 He is also the Third captain to have won 100 ODIs after Ricky ponting and Allan Border. 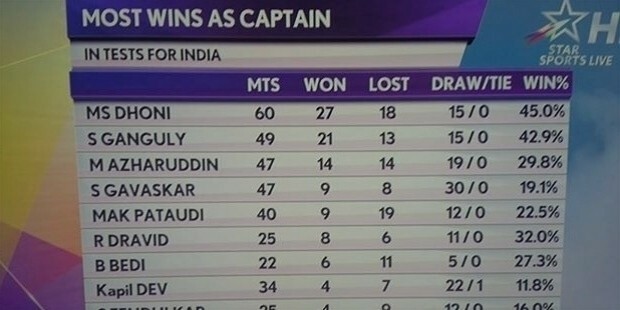 Only a few players have been wicket-keeper Captains for their team for a long time, Dhoni ranks at no. 1 beating Gary Alexander by over 15 who ranks second in that list. Adding on to that achievement is another one that, he’s the highest scoring wicket-keeper captain on the world in a Test. As a wicketkeeper, he completed his ‘Double’ (4000 runs, 100 dismissals) in just 114 innings. He’s the sixth in the world to do so, and the youngest one by far to have achieved that feat. He's the only wicket keeper in the world who has taken a wicket. not just a batsman and a wicket keeper, but our Captain has proven himself as a bowler too. he took the wicket of Travis Dowlin of West Indies. In Indian Premier League, he signed up with Chennai Super Kings in 2008, and in the last six seasons, has won the trophy twice. He’s the only captain to have achieved that feat. 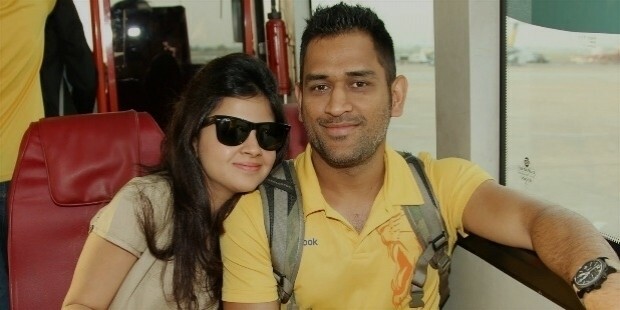 In 2010, Mahi married Sakshi, his childhood sweetheart. Sakhshi was his classmate whilst he was at DAV Jawahar Vidya Mandir, Shyamali, and she was then studying Hotel Management in Kolkata, and working at The Taj Bengal as a trainee. They have known each other all their lives and their families are close friends as well. Sakshi’s family is native to Dehradun, Uttarkhand. and it’s known that their family moved back once her father retired from his service. Despite the fact that they had a very short engagement (just one day) friends of Dhoni assured interviewers that the wedding was properly planned and executed, and not a spur of the moment decision for anyone involved. Amongst his friends was the renowned model and actress Bipasha Basu, who is a close friend of Dhoni. 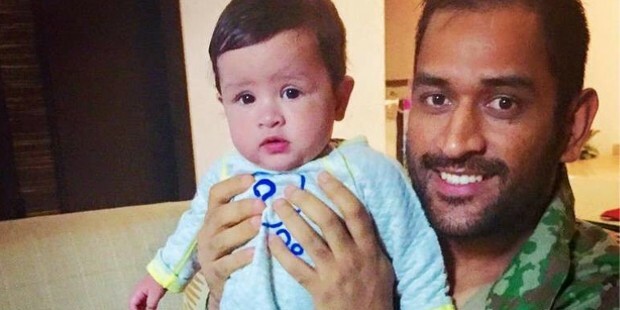 In February of 2015, the couple welcomed a baby girl named Ziva. M.S. Dhoni: The Untold Story is a Bollywood biographical film directed by Neeraj Pandey, based on the life of Mahendra Singh Dhoni. Fox Star Studios distributes the film and produced it jointly with Inspired Entertainment and Arun Pandey, in association with Friday Film Works. The film features Sushant Singh Rajput as Dhoni and Disha Patani, Kiara Advani, and Anupam Kher in supporting roles.